The Touchsquid is a new category of home entertainment controller. It not only controls all your devices but allows you to surf the net, check your emails, and make video phone calls. The high resolution 7" easy touch screen makes even small print easy to read. Too many remotes and gadgets? The Touchsquid replaces a basket of remotes and a tablet computer. With both Wi-Fi and Bluetooth, the squid has connections aplenty. With a powerful Freescale processor and high resolution (1024 x 600 pixels) capacitive touchscreen, the Touchsquid delivers a fast and fun user experience. A huge database of device codes allows it to control over 12,000 different home entertainment devices. Most remotes have dozens of tiny, hard to read buttons, often unlit. The Touchsquid's huge 7" screen allows big bright buttons that are easy to see and operate. Perhaps even better is that the Squid only shows the buttons you need. Universal remotes are notoriously difficult to set up. Some require an internet connection, another computer, and downloaded software. Not this one! The Touchsquid can be set up in minutes without help. The Activity based setup means you can switch on all your devices with one button. Watch TV, play a Blu-Ray disc or record your favorite shows. But wait, there's more! 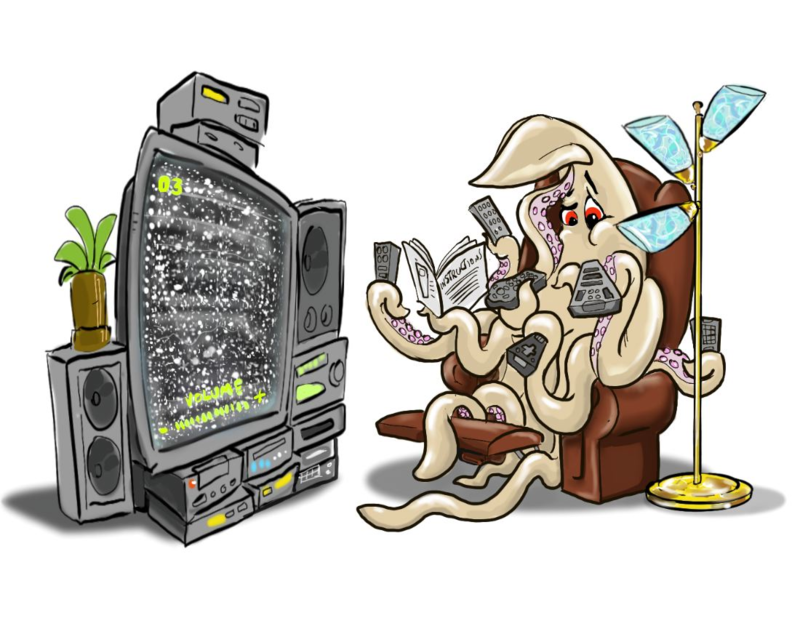 Pop over to the browser and check the TV guide, research a movie on IMDB or even watch YouTube videos right on your Squid. The Squid can run over 100,000 Android apps, most free, and some of them even useful! When the TV is off, you can still use it to check email, surf the net, or make a video call with the built in 1.3 MP camera and microphone. Play your music collection through the built in stereo speakers or plug in a pair of headphones. The Touchsquid has 4 GB of built in storage and an SD card slot allowing you to add an additional 32 GB (enough for a huge collection of music and videos). The Squid comes with its own nest, a drop in charging stand it lives in when not in use. Even in the stand it can serve up the time, weather, and remind you of appointments. The Touchsquid is powered by a long life lithium-ion polymer battery, which unlike some is easily replaceable. The entire device with battery is warranted for a full year including parts and labor. The Touchsquid will be available in major electronics retailers and online at http://www.touchsquid.com. The MSRP is $399. The Touchsquid Logo The Touchsquid Remote app Too many remotes? Get a Squid.